Bethel Church was destroyed by a tornado November 10, 2002. "In conformity to a request of a number of members of the Presbyterian Church, located below Columbus, about 10 miles, the Rev. David Wright was appointed by the Tombigbee Presbytery to visit them and form a church in the month of June, 1834. Mr. Wright assisted by the Rev. C. Kingsbury attended at the place appointed, and proceeded to organize the following persons into a church in conformity to the directions of the Form of Government of the Presbyterian Church, namely: Males: Drennan Love, Thomas R. Witherspoon, William Ervin, James W. Ervin, Females: Elizabeth L. Love, Margaret J. Witherspoon and Rosamond Odeneal, Servants belonging to T. R. Witherspoon: Nero, York, Sally, Anthony, Nancy, Satirah, Venus, Amborse, Sarah and Dinah. Messrs. D. Love, T. R. Witherspoon and Wm. Ervin were elected Ruling Elders. 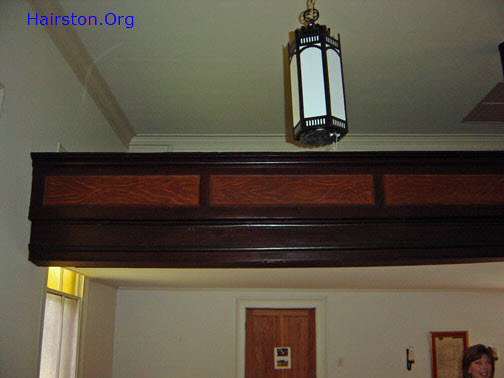 Mr. Ervin was installed, and Messrs. Love and Witherspoon regularly ordained and installed." 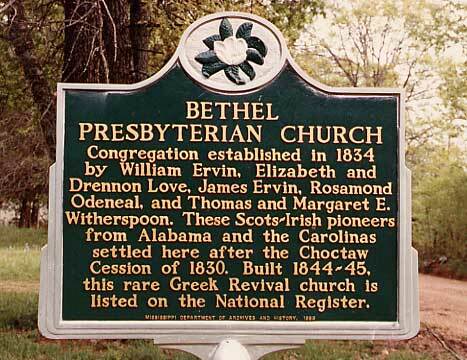 Old write ups of Bethel history state that the first pastor was Rev.Cyrus Kingsbury, who had arrived in this area in the spring of 1820 as a missionary to the Chahta (Choctaw) Nation and established Mayhew Mission; however the early Bethel Church register lists Rev. David Wright as the first pastor from June 1834 to April 1836. The Moderator D. L. Gray wrote in the record book that the first sermon preached at the church was Psalms 9:17: "The wicked shall be turned into hell, and all nations that forget God". At first, according to the record, meetings were held on the premises of Capt. William Ervin, under a large oak tree. Next, by united effort of the neighborhood, a building called the "Shelter" was erected near the spot of the first meeting. The simple structure was made with a floor and roof of boards supported by posts set in the ground. 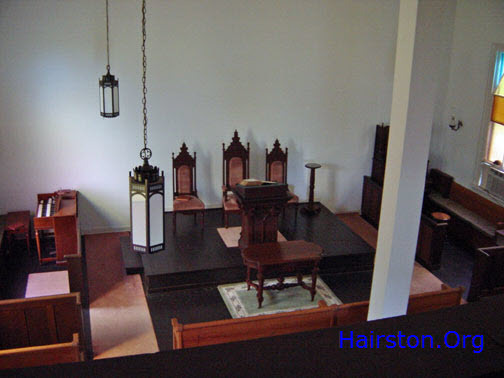 The seats were of split logs placed upon blocks, and the pulpit an elevated platform enclosed on three sides by boards. In inclement weather, the congregation moved into the residence of Capt. Ervin, later the home of J. C. Cox. A log church was built in 1840. This was replaced in 1844 by the present white frame building some three miles northwest of the original site. This structure was erected on land deeded by E. P. Odeneal to Artemus C. Jennings and Drennan Love, Trustees for Bethel Church "for in consideration and regard and esteem he has for the church and for the purpose of promoting vital piety has this day granted and donated to the Trustees as aforesaid all the following pieces or parcel of land commencing at a blackjack tree about 180 yards from the southeast corner nearly two acres". 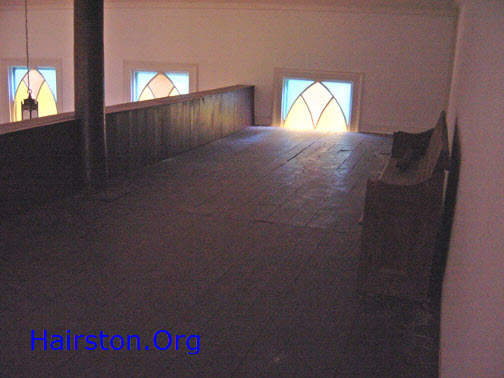 The church's members agreed to pay Artemus Jennings the money needed for construction. Their names and the sums pledged were inscribed on a large sheet of paper. Harden Hairston was one of these donating to the building fund. As each member turned, in his obligation the payment was noted on the sheet. The original record of these payments has been framed and is displayed on a wall in the church. From this time to the present Hairstons have worshiped here. The timbers from the original structure were moved to form a foundation for the new house of worship. The floor is slightly higher in the center, which presumably allowed for water drainage in the original open shelter. The two front columns were made from two large walnut trees cut off of Artemus Jennings' land, which were floated down the Tombigbee River to Mobile for turning and shaping. 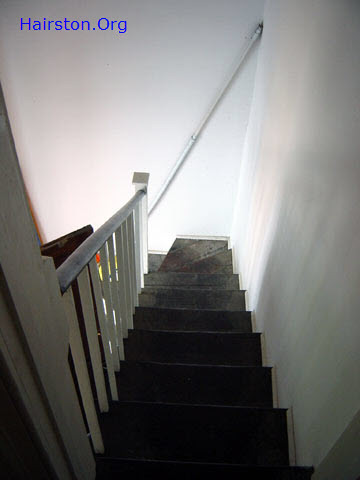 Enclosed stairways go up from each side of the front porch to a balcony, originally used for servants. 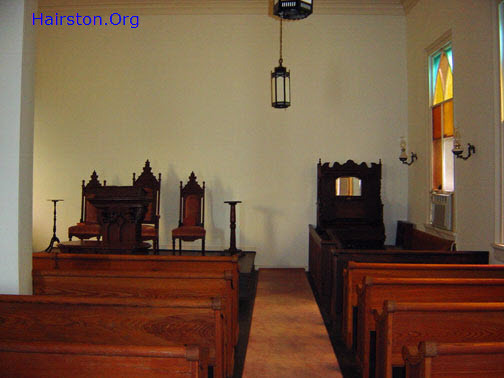 The pews presently in the church date back to 1844. At the rear of the church lies a small cemetery where many of its early members are buried. The oldest tombstones in the cemetery date back as far as the 1840's. Here also are a number of unmarked graves of unknown Confederate soldiers. Northwest of the church lies the cemetery still used by descendents of the early colored members. Most of the early membership of the church came from South Carolina and from all accounts, were somewhat puritan by nature. The early church record gives many instances where members were 'disciplined' for conduct unbecoming a Christian, sometimes even being 'dechurched'. One case, charging "immoral conduct", accused a member of salting and cutting meat on the Sabbath. When the defendant explained it was caused by the "sudden change in the weather", members of the Session issued a reprimand which said the defendant had killed too many hogs on Saturday, thus causing both himself and his help to labor on the Sabbath. Another tells of the long and involved trial which followed when a ruling Elder in the church was accused of slandering the minister by saying he had deliberately lied. One Elder even withdrew from membership because he felt he lacked a Christian character. There have been many ministers who served this solid center of faith. The Rev. Mitchell Peden was Bethel's first regular (rather than stated supply: and he served from 1847 to 1850. 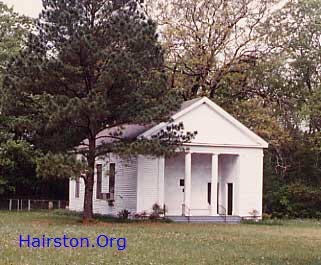 Next was the thirteen year pastorate of Andrew Barkley, 1860 to 1873 who was married to Sallie Alice Hairston. The Rev. T. D. Bateman served for twenty-two years. He not only delivered the sermon, but after announcing the hymns would go down and play the pump organ. Dr. Horace L. Villee served as pastor from 1949 to his retirement in 1971 and his wife, Margaret, played the organ. Among the congregation's memories of him is the vivid picture of the imperturbable pastor never missing a syllable as wasps, who found the church a haven too, circled about his head, even lighting on his ear. The present pastor is Dr. Roe Callaway, Jr. The organist is Mrs. Charles Ferguson. In some periods of Bethel's history the congregation has been large enough for Catechism and Sunday School classes, a Ladies Aid (organized 1895) and even to host Presbytery meetings. As the old families of the Prairie section have died, the membership has gradually decreased to thirteen. The two oldest members of the church are both 92 and are both descendants of the Hairston family. They are Laura Mae Hairston Cotton and Lilla Chandler Rice. 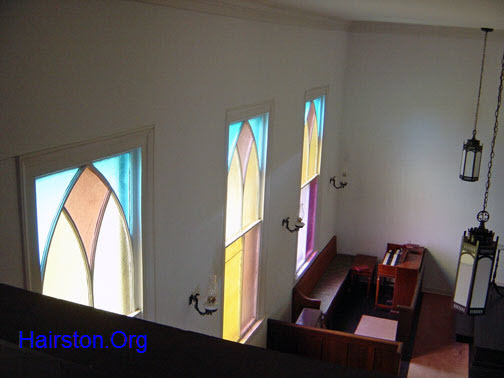 Services are now held on the first Sunday of each month at three o'clock and the present members and friends, most of whom are sixth and seventh generation descendants of the early members, drive out to worship, in this historic and hallowed place.